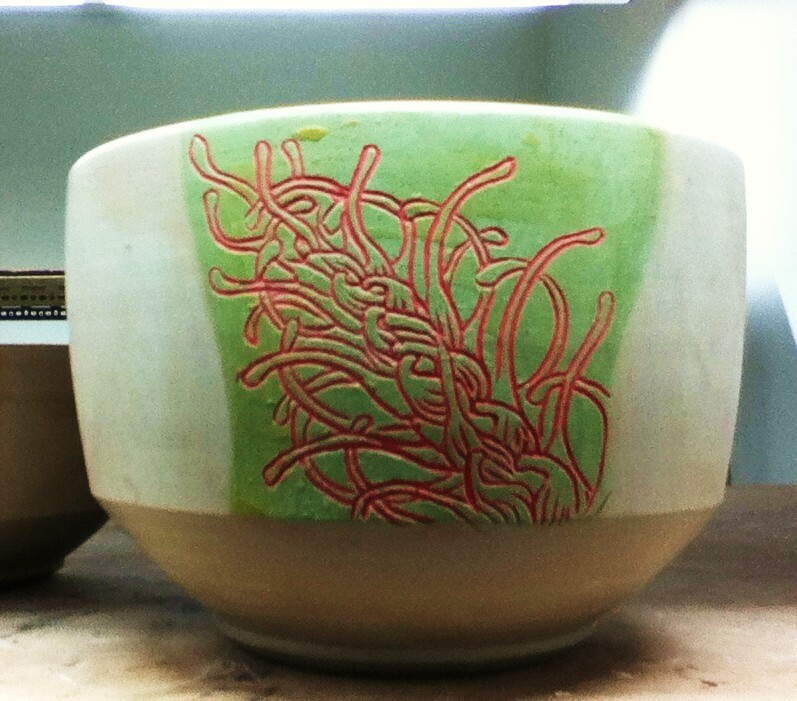 Photo: greenware work in progress, a big serving bowl with an Australian Grevillea flower inlaid in red underglaze. Sometimes, the world is too noisy of a place for focus. Too much going on, too many people who don’t understand– it’s all noise. Mind games, heart break, exclusion, and social drama are a few noisy things that I would like to eliminate from my life for a little while. The second two are easy fixes to tune out. As for the first two… I can at least temporarily make them go away. My solution to eliminating some of the noise is to move to a less hostile environment– which will hopefully have happier lighting as well. I am moving from one on campus housing unit to another one is search of a better vibe. I haven’t been myself for the last couple of months, and I realized just how far out of tune I was last week after a big party, a bad hangover, and a shocking revelation. Those two days were enough to make me reflect on how I have been acting and why my work in the studio has been half-assed. If I was slacking like this at my home university, my professors would probably be disappointed in me. I haven’t been feeling great about my studio ethic this semester, but I am working on changing it this week. I am getting back to the me I used to know, and how I would like to see myself as a person. I stayed home from the club on Saturday because I didn’t feel like drinking at all. I decided to read a book and enjoy the quiet while everyone was gone. And for the first time since I got here, I didn’t feel guilty for staying in and I didn’t feel left out because I honestly didn’t want to go. Plus, I had already been enough times to know what I was missing– which isn’t anything great. I would rather wait to go to the club with my real friends. 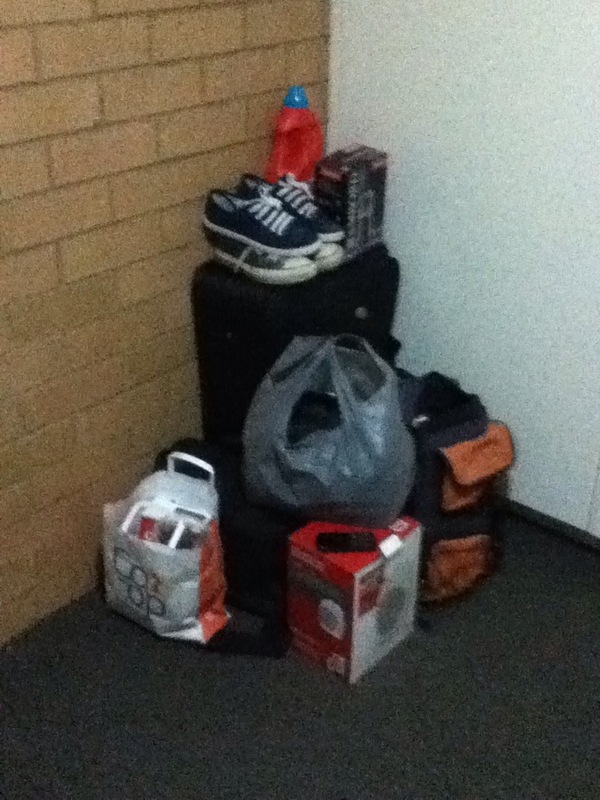 All of my material possessions fit in this pile. The only things missing are my laptop computer, my iPod, and my sheet set. The dunie cover here isn’t even my own– it was given to me along with a pillow when I got here. I guess I have some food and wine that’s not pictured, but that’s a different category. It would all fit in two or three plastic grocery bags as well. I guess moving out tomorrow will be really easy. This entry was posted in Art, Ceramics, Daydreaming, Deep Thought, Drawing, Nature, Uncategorized and tagged australia, grevillea flower, humility, moving day. Bookmark the permalink.